It had been 435 days, encompassing parts of three calendar years, since the University of the Fraser Valley men’s basketball team last lost a Canada West regular season game. On Super Bowl Sunday, as the Seattle Seahawks were busy snatching defeat from the jaws of victory against the New England Patriots, the Cascades finally met their match. The Mount Royal Cougars weathered a trio of potential game-tying or go-ahead shots by UFV in the dying seconds to secure a 74-72 victory in Calgary, snapping the Cascades’ conference win streak at 29 games. UFV head coach Adam Friesen, pondering the result, acknowledged the win streak had been “something special,” but said the loss is a valuable learning experience for his team with the playoffs looming. “You never set out to lose, but it’s an opportunity for us to get that winning streak off our backs and really focus on what we need to be focusing on, and that’s getting ready for playoffs,” he said. Prior to Sunday, the Cascades hadn’t lost a Canada West regular season game since Nov. 23, 2013 – an 83-62 defeat at the hands of the Saskatchewan Huskies in Saskatoon. The following weekend, they launched their winning streak with a pair of home victories over the UBC Thunderbirds, and they would go on to stretch it to 29 games, including a dominant 87-65 triumph over Mount Royal on Saturday evening. The Cougars, battling for their playoff lives, were sharp from the opening tip in the rematch, and built a 14-point lead midway through the second quarter. The Cascades drew to within 38-30 at the break, and claimed a 52-51 lead on a Kadeem Willis layup with just under three minutes left in the third quarter. But Mount Royal ended the frame on a 7-0 run, and the fourth quarter was a back-and-forth affair. The Cougars led 72-68 with two and a half minutes to go in regulation after Awet Abraha’s layup, but the Cascades were efficient on their next two possessions to tie it up – Vijay Dhillon hit a pair of free throws, and Manny Dulay knocked down a long two-point jump shot with 1:27 left. But those were the last points the Cascades would score. The Cougars edged in front after Abraha and Derek Wolfe both went 1-for-2 from the free throw line, the latter coming with 13 seconds left on the clock. After a timeout, UFV inbounded from halfcourt, and Dulay set up Kadeem Willis for a clean look at a three-pointer but his shot rimmed out. Jasper Moedt tracked down the rebound but missed a putback attempt, and the ball went out of bounds off Mount Royal. Willis took the ensuing inbounds pass and drove the left baseline, but his shot rolled off the front rim, and Moedt’s tip-in came after the buzzer had sounded. Dulay led the Cascades in scoring for the second straight night, counting a trio of three-pointers among his 17 points. Kevin Parchment chipped in with 14 points, Willis scored 13, and Moedt had a double-double with 10 points and 19 rebounds. Moedt’s boarding binge moved him to the top of the Canada West rebounding chart – he boosted his rebounding average to 10.8 per game, and leapfrogged Josh Wolfram of the Thompson Rivers WolfPack (10.6) in the process. Power forward Nate Brown, the Cascades’ third-leading scorer (12.3 points per game), played just four minutes before departing with a nagging leg injury. “He wanted to warm up and give it a go, so we let him try it, but he wasn’t 100 per cent so we decided to shut him down,” said Friesen. Indeed, resting Brown makes sense in light of the fact that Sunday’s result will have no impact on post-season seeding for the CIS No. 8-ranked Cascades (15-1). They had already clinched first place in the Explorer Division by virtue of Saturday’s win. The fourth-place Cougars (7-9), meanwhile, needed a win in the worst way – they’re still two games back of the Thompson Rivers WolfPack and the UNBC Timberwolves (both 9-7) in the race for the last two Explorer playoff berths. 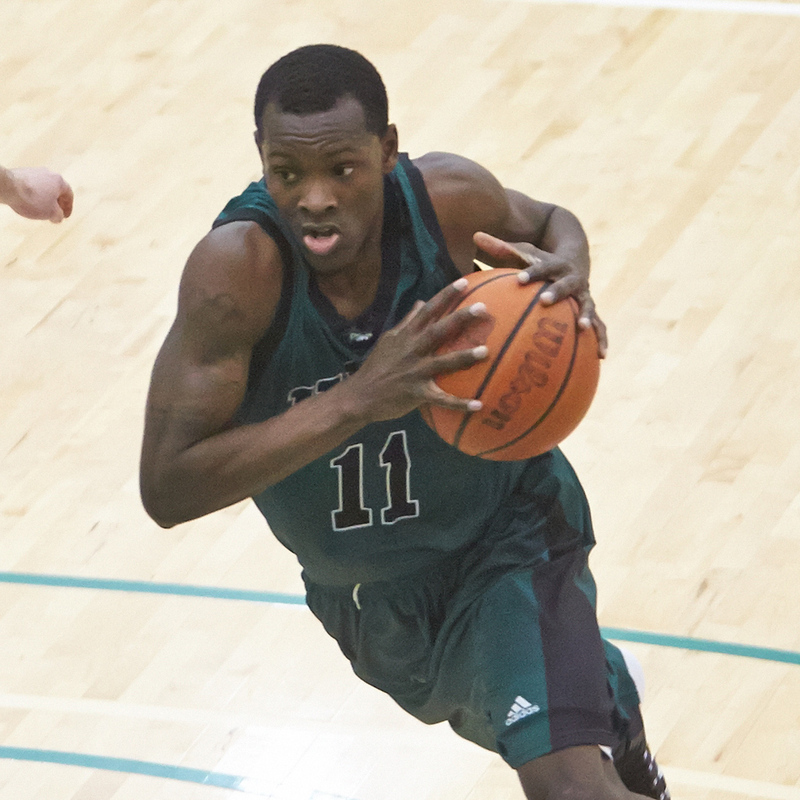 UFV faces UNBC on the road this coming weekend, while Mount Royal visits Thompson Rivers.